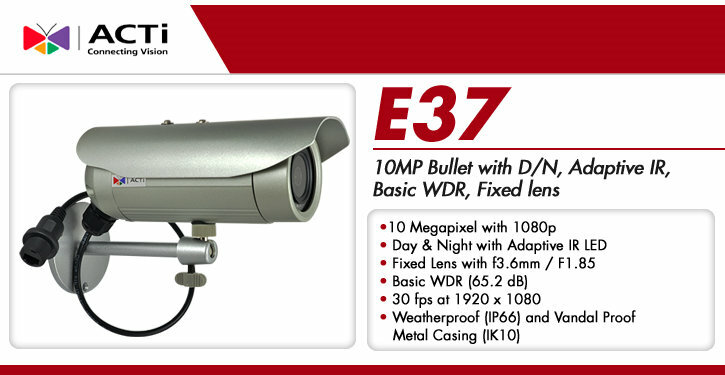 The ACTi E37 10MP Day/Night Camera is an HD camera that produces crisp, clear recordings. Capturing at a 10 Megapixel with 1080p resolution, images are detailed without noise or grain. The Adaptive IR lens used in the camera records in both brightly lit and dark or shadowed conditions. With a fixed focal length and an aperture size of f3.6mm / F1.85, it captures video across a wide range. The camera automatically adjusts brightness and contrast setting with the use of Basic WDR (65.2 dB) to produce flawless images regardless of the setting. This versatile camera uses a progressive scan CMOS sensor with a frame speed of 6 fps and 30 fps to record moving objects with precise detail. 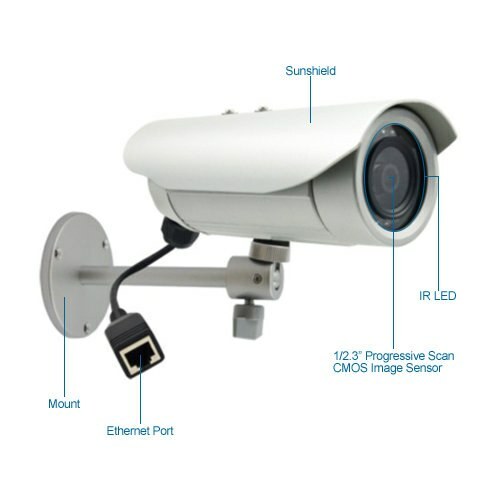 Additionally, the weatherproof (IP66 rated) and vandal resistant (IK10 rated) dome of the ACTi E37 10MP Day/Night Camera makes this a perfect solution for outdoor use.